Cereal, pancakes, oatmeal and omelets.…breakfast can feel like one big "same old, same old" after a while. If you're sick of making your normal breakfast rotation I bet your family feels the same way about eating it. 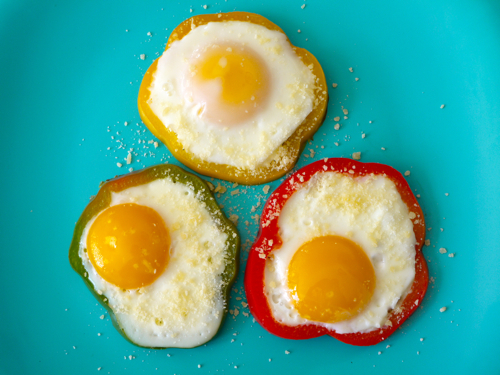 Whenever I whip up these Bell Pepper Egg Flowers in the morning to my kids it's like I bought a brand new car. It's such a welcome novelty that my little guys go nuts with excitement! 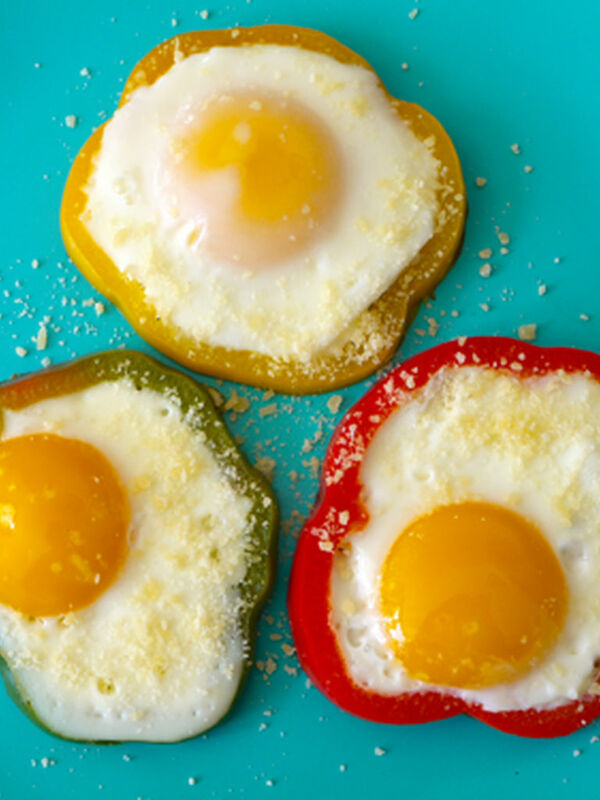 They both adore bell peppers and by adding a perfectly cooked egg and a sprinkle of parmesan cheese on top, this breakfast treat is an easy way to get protein and even a bit of veggies into my family's bodies first thing in the morning. Remember that FTD Mother's Day slogan, "say it with flowers"? Well, after watching your kids make all gone with this recipe I think you'll agree that roses and tulips aren't the only flowers that can make a mom happy! 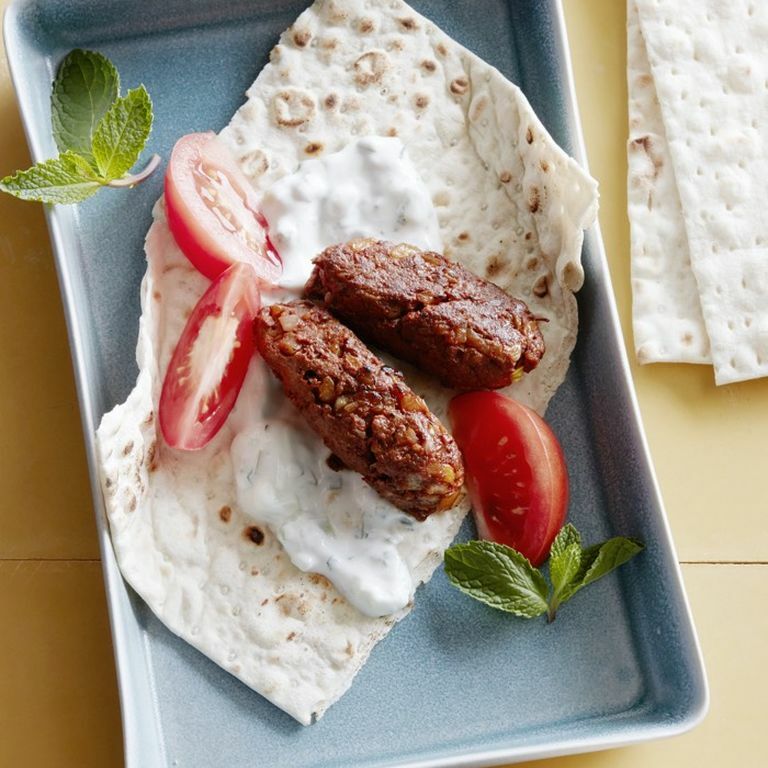 This recipe is part of Food Network's Summer Fest! Check out all the other pepper recipes below! 1. Take 1 large bell pepper, slice into four 1/2″-thick rounds (or “flowers”) and remove the inner membranes (or white part). 2. Heat 2 tsp of olive oil in a skillet over medium heat and cook the flowers for 2 minutes on one side. 3. Flip the flowers over and crack an egg into the middle of each flower. 4. Cover skillet and cook for 2-3 minutes for runny eggs or for 5 minutes for firm eggs. 5. Sprinkle each flower with Parmesan a few seconds before you are ready to remove it from the pan. Yum! I LOVE red peppers in omelets so I bet this would be delicious. And it seems like it could be quick enough for a busy morning, a big plus! Yum! You are so clever:) love your site. what an awesome idea! you rock! Girl, you are amazing! Thanks! I love this! My kids like the eggs in a nest and they LOVE their green peppers! 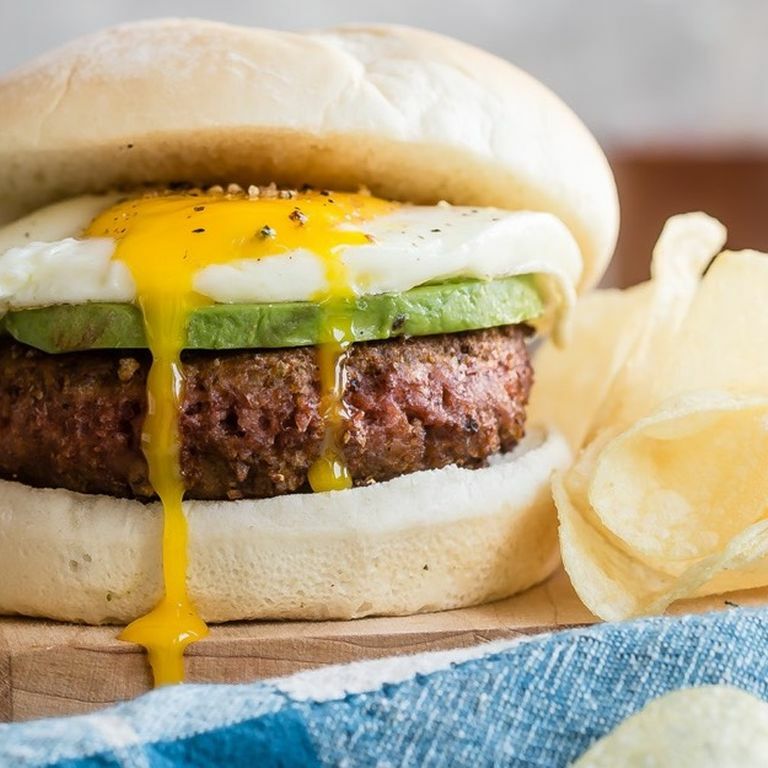 What a fun way to change up breakfast! What a clever idea! Thank you for sharing. Yes! It will work in a cookie cutter if you grease it well and be super careful (use tongs) when you slide it off the egg. This is too cute! I may just make some for myself. Great idea!! My daughter loves peppers. She likes her eggs scrambled. Could I pour scrambled eggs into the pepper flowers? Revealing your creative juices, again! Wish I had thought of this idea. Well done. Will pass this egg flowers breakfast along giving you the credit. 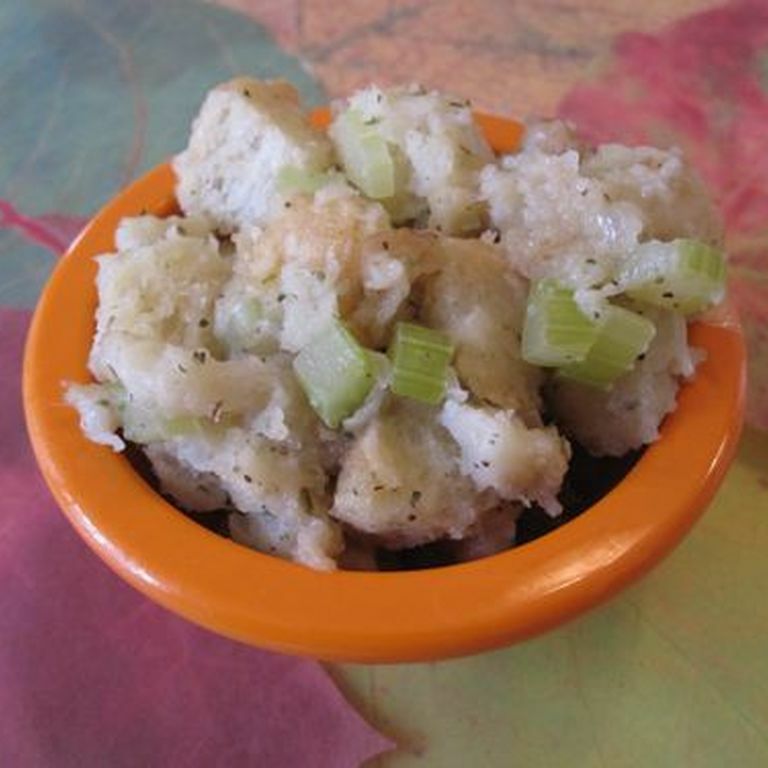 Can't wait to put this recipe before the Kid Kritics... for the health of families. adorable! my daughter will love these (and i will too - such a great idea for a type 1 diabetic breakfast). we are always looking for new bkfst ideas - thank you!! wow! that's smart. i am going to try this weekend. I do accept as true with all of the ideas you have ofrfeed for your post. They are very convincing and will definitely work. Nonetheless, the posts are very quick for starters. May you please lengthen them a little from next time? Thanks for the post.